But she knew instinctively that he was not the same. 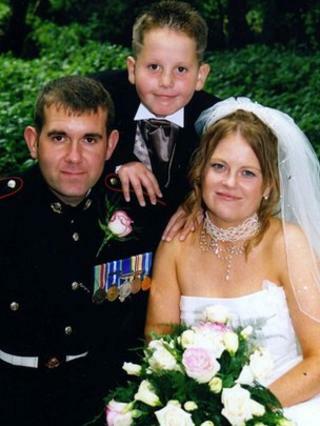 Steve, a Royal Military Police sergeant, loved his job but something had changed. "I'd be sitting watching TV, but be in another place thinking about things that happened to me, things that I had witnessed. "I started reliving them after my operational tour in Afghanistan, but there were also memories of previous tours in Rwanda, Iraq, Kosovo, and Northern Ireland," he remembers. The 38-year-old had been part of a "mop-up team" in Iraq, which involved clearing charred and disfigured bodies. He also witnessed the results of genocide in Africa and experienced lengthy firefights in Afghanistan. "I would have a flashback, where I'd get the taste, the smell, the feelings and start sweating. I was constantly on edge, lying awake at night, reliving events, and I'd get only 40 minutes sleep at night, maximum," he admits. "It was affecting my life massively. I didn't think I had post-traumatic stress disorder. I just thought I had a problem." His wife Karen - a staff sergeant in the Royal Army Medical Corps - finally persuaded her husband to go to the military medical centre. He was reluctant, as the career soldier did not believe in "going sick". Staff there quickly realised he was in urgent need of help, referring him to the Priory clinic in Woking. "They said they'd take me somewhere where I was safe, after I told them I had rehearsed how I was going to kill myself." For several weeks, he was given everything from trauma-focused cognitive behavioural therapy to art therapy. But as the only soldier there, the sergeant did not feel able to share what had happened to him with the rest of the group or even share the pictures he had painted of his experiences. He worried that they might upset the other patients. "But I still needed to tell someone. So I bottled everything up again for weeks, until someone said to me 'we'd like you to do EMDR'. I'd never heard of it before." The therapist described what would happen during the EMDR therapy, which stands for Eye Movement Desensitisation and Reprocessing, and was approved by the National Institute for Health and Clinical Excellence in 2005. It works on the theory that traumatic memories have not been properly processed by the brain, but can be reprocessed correctly via therapy involving eye movement, and using sounds or taps to the skin while going through the past traumas. "The therapist told me that I would relive the events, but that like a computer, the therapy would 'defrag' the memories and put them into some sort of order so that I could deal with them." During that first session, Steve went back to some of his worst memories, once again experiencing the taste of petrol, and the smell of helicopter fumes and burning. After a matter of weeks, EMDR began to have an effect, and he was able to share the traumas he had kept locked away for years and return home to Karen and his work. But a posting to Northern Ireland saw him suffer a setback. So the Army paid for him to continue the EMDR therapy at a nearby private clinic. "It was fantastic, and after I'd dealt with the events I needed to, I found I could return to work full-time, with the full support of my boss." Not all soldiers will suffer from post-traumatic stress disorder (PTSD) - military rates of 4% or so are roughly the same as those of civilians subjected to trauma. But recent studies show that repeated exposure to combat may raise that rate to 6.9%, according to Dr Susanne McGowan, a consultant clinical psychologist with the MoD who uses EMDR therapy. Some are still sceptical about the treatment, although studies have shown that it works as well as, if not better than, many other therapies available for dealing with trauma. EMDR therapists now work in every defence community mental health centre. Dr McGowan says the military's traditional culture of "getting on with the job" means that sometimes servicemen and women hesitate to ask for help or worry that doing so may impede their careers. "It's a big issue for us to try to get people to recognise that these horrible debilitating symptoms can be helped, and can be resolved," she says. "Service-people do have this likelihood that they may have had many traumas, but the positive thing is that the population at large is recognising military personnel and the sacrifices they are making and that's an important part of treating them." For Steve's wife Karen, it was tough dealing with a husband who could not talk about what was wrong. "It had a big impact on me. I'd never dealt with PTSD before and when he came back from Afghanistan he wasn't sleeping, yet he was blaming something else. Deep down I knew and kept pressuring him to go to see someone," she says. That intervention may have saved her husband's life. "A couple of months into his stay at the Priory, it was difficult because he'd call me up and say he didn't want to see me. But eventually he started opening up to me," Karen recalls. Steve is looking forward to his six-month deployment to Helmand later this year, but Karen admits she's worried. "He's come a long way, but I'm concerned he's going to relapse and go back to the way he was and I don't think I could go through that again. "He used to sit inside and just shake. At least I am aware now and I know the signs, so if it happened again I'd be able to help him as much as I can - and just be there for him." Steve and Karen are willing to speak out on an issue many would rather not talk about because they believe others in the military should not suffer in silence. He has given lectures to his comrades and others on PTSD and the help available in order to raise awareness. "Guys have come up and spoken to me since then and said 'thanks - I'm now seeing someone'. I think with the exposure in the military to some traumatic things there are going to be problems and it's not a weakness. "The effects of war are a hard thing to get over. You have to be a strong person to admit that to yourself and sort it out, rather than bottling it up." What is life like for Helmand blast survivors?